It's been a hard couple of weeks getting The Handmade Sessions open, and we could use a few more things up on the walls, but we will be officially open for business on Tuesday, June 21st with a wood carving workshop. The delightful Pam de Groot was with us for three days and taught master level felting and resist dyeing to christen the space. The walls are already dirty and need to be repainted! We all had a great time and learned so much. Many, many thanks, Pam, for making the trip to our corner of the world! Please join Craft in Kerry in celebrating our new venture, The Handmade Sessions, on Monday, June 20 at 4pm on John St in Dingle, Co Kerry at our new venue opposite Galvin's travel agent. We will be showcasing some of our craft workshops, including wood carving, felting, knitting, spinning, and clothing upcycling. All welcome! All workshops are 2-530pm for the present time and cost €35, materials included. Please contact +353-087-9111793 or email handmadesessions@hotmail.com. Lots of great workshops coming and if your group would like a day-long workshop, please contact me as we can accommodate that! Parking in old CBS parking lot just four doors up from us on the right. Marika making design decisions with her prefelts. To say that I have been busy has been a major understatement. I finished my job at the creche and had one day off to organize and then headed to the Malton Hotel in Killarney for the Kerry Tourism Expo. It was excellent. There was great enthusiasm for the Handmade Sessions and we got a chance to really network in Kerry for Craft in Kerry. It was a long day, but well worth it. My sister had arrived the night before on a rather horrible trip into Ireland and so went swimming with my son while I was talking and talking and talking at the Malton. Between jet lag and her hangover, she wasn't doing all that well by late afternoon. We recovered from that marathon day and then had just the next day to run around and get ready for my son's Holy Communion, the reason for Auntie Jen's visit. The weather was windy and sunny on the Friday, but Saturday dawned with awful weather. We barely got into the church intact and could hear rain hammering on the ceiling of the church during the Mass. The service was lovely and so beautiful. My son has been in school with most of the other kids since they were 3 years old and so it was so lovely to see them so grown up and innocent and wonderful up there. I was so proud of my boy. And it was over all-too-soon and then we were down to the Skellig Hotel for lunch and a bit of needed relaxation. Many glasses of wine later, we collected a pizza for the exhausted Communion boy and headed home to watch the film of his choice. Up for Mass the next morning and I lost count at the amount of times the Communion children were yawning. It made for a slow and easy afternoon (full of wind and rain, of course). Next day, we took off to Co Clare for three days. Liscannor, Doolin, and Ennis. It was lovely and sunny for the Cliffs of Moher and Doolin, but raining, raining, raining all the other days. Two different taxi drivers recognized me from Nationwide, which I found a bit disconcerting--I don't want to be recognized! We had a great visit, however, and we dropped my sister at the airport and headed off back to Kerry. And now, I am frantically preparing for the launch of the Handmade Sessions. We have venue, we have instructors, and we have (mostly) enough money. Marketing materials being printed, venue getting painted next week, and workshop materials are being gathered. 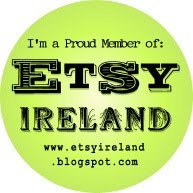 Please check the calendar for Handmade Sessions at http://craftinkerry.blogspot.com/. There are lots of great workshops coming up. The calendar should be finalized by this weekend! Life is in the details!